Recently my 9-year old daughter has been watching a certain t.v. show and coming back with some pretty snarky retorts. It’s been driving me bananas! What do you do about a ‘teen’ attitude in your child? How do you deal with media that may not be sending the kind of message you want? 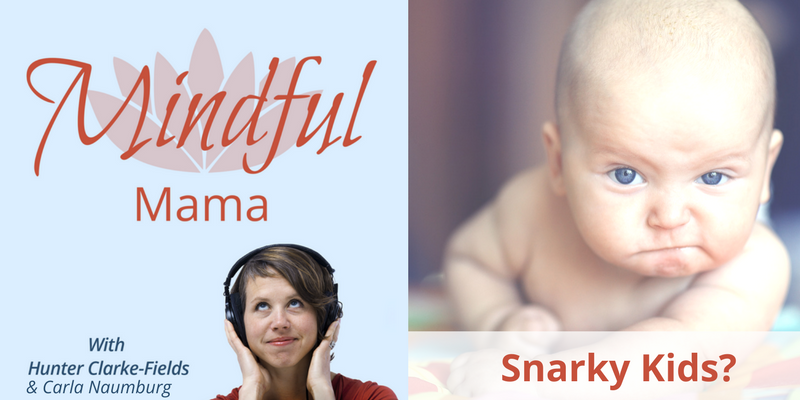 Carla Naumburg, author of Parenting In the Present Moment, and Hunter Clarke-Fields, Mindfulness Mama Mentor hash it out in today’s episode. This is the first in a monthly installment of Carla and Hunter’s back and forth. Mentioned in this episode: Louis C. K. talking about cell phones. This is brilliant and you should not miss this. In a few days, the 10-Day Mindful Mama Virtual Retreat begins! This free, online event is specifically for moms who want to be less irritable with their kids. It will help you begin your own mindfulness practice in the company of hundreds of other mamas. And Carla is in it too! And the Mindful Parenting Course is coming! Want in? Click here to get on the wait list. P.S. Don’t forget to join this free 10-Day retreat that starts in a few days!